Subscribe to comments with RSS or TrackBack to 'Ask Collier 2/1/19'. Just saw a headline on MLBTR: “Padres Meet With Bryce Harper.” Good place for him. He can swing for the fences every at bat trying to hit 440-foot HRs regardless of game situation until his heart’s content. MLBTR also has an article up about what the teams that had the five worst bullpens in baseball last year have done to upgrade (the Nats were ranked #5). They’re calling this year’s group “high risk–high reward,” but unfortunately we know all too well how that usually goes for the Nats when it comes to bullpens. Hope they can get lucky and find another Albers-type reclamation project for near league minimum. They could sure use the depth. I’m tired of the ongoing chatter across the Natosphere about a 5th starter. When healthy, Joe Ross has proven that he can be an above-average major-league starter. Yes, there are questions about whether he can stay healthy and if/when he will be shut down, . . . but there’s also Fedde in the mix. He was a high draft pick, has been a highly touted prospect, and xFIP suggests that he’s better than his results indicate thus far. Beyond them, I don’t set much stock in the Henderson Alvarez flyer, as he hasn’t been good since 2014. I expect that they’ll be looking for more Fresno filler of better quality. McGowin showed some possibly last year, and Voth rebounded a bit. Can’t see them, under any circumstance, blowing through the tax line just to sign Keuchel. 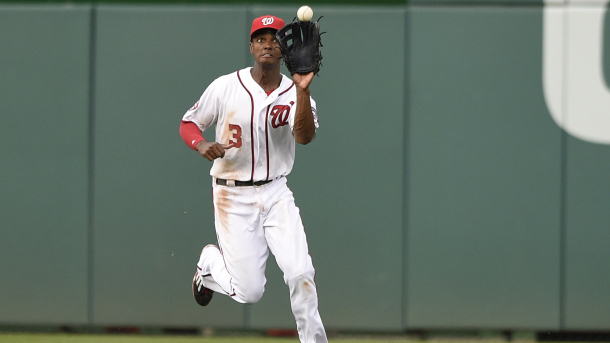 NL East: the Nats should be favored for first and the Fish for last. Beyond that, I have no clue. The Braves’ offseason has been one of the most head-scratching to me. They’ve got a lot of cap room and theoretically a good cash flow with good revenues from their new stadium. With a couple of additions, particularly in starting pitching and maybe RF, they could be a really good team. Instead, they’ve done very, very little. They brought back the aging Markakis and took a one-year flyer on Donaldson. Except they already had a good/young/cheap player at 3B in Camargo. Anyway, the bottom line for me right now is that I don’t think the Braves have a rotation that can get them to the playoffs. Maybe that changes between now and April; maybe it doesn’t. The Phils’ and Mets’ offseasons have also been head-scratching, but for different reasons. The Mets certainly have made moves, and if everyone were to stay healthy, they could be a threat to win the division. Or they could fall apart and have a fire sale at the trade deadline. We’ll see. The Cano deal looks pretty suspect until proven otherwise. The Phils, on the other hand, haven’t spent much of their “stupid money.” They’ve still got a lot of holes. I’d have them below the Mets in my pecking order at the moment unless and until they land a big fish or two. And the Nats? They’ve certainly got the rotation. They’ve bet big on Rosenthal to solidify the back end of the bullpen. The lineup looks good on paper, and the defense should be improved. Their rookie manager is no longer a rookie. No excuses. The Braves’ strategy makes sense to me as part of a long term plan, though I agree with KW that, as currently constructed, they do not have a playoff-caliber rotation (though I should note that I did think they had a playoff-caliber rotation last year). The reason I think the Braves’ strategy makes sense is that they have a number of highly-touted pitching prospects in the upper minors or MLB. None of these guys is a slam dunk. But, because the volume of pitchers they have is so high, we might expect one or more to turn out to be better than advertised (just as we might expect one or more to turn out to be worse). Because pre-arb players that turn out to be good are so valuable, I think it makes strategic sense to find out what you have and to use money to patch holes only after you gather more information about the quality of your pitching prospects. If I were a Braves fan (I shudder to think…), this strategy would bug me because the team forewent ways to improve in 2019, which might cost the team a playoff berth. But I understand it. Clarification: I did NOT think the 2018 Braves had a playoff-caliber rotation at the beginning of last year. Glad to join the dialogue. Congratulations on a premier site for Nats fans. I’ve been a reader for years. Mostly agree with KW’s assesment about the NL East for the upcoming season. Just one comment though, I have a hunch in a year or two the Cano deal might be referred to instead as the Edwin Díaz trade. He is that good. Robinson Cano, on the other hand, might never be the imposing hitter he used to be a few years ago. Just read potentially good news on Hellickson. A back end of the rotation with Sánchez and Hellickson if handled properly can work; particularly, if the long relievers are (1) effective and (2) being managed properly, as well. LH–Welcome to the conversation. Yes, the Mets (Diaz) and Phils (Robertson) have definitely improved the back ends of their bullpens. The Mets have the starters to get them to the ‘pen. As for the Phils, I really thought they would/needed to add a couple of starters, but they didn’t. They were mentioned in connection with Morton, and have been a little with Keuchel, but they’re already got a couple of top-of-the-rotation guys, so I thought it made more sense for them to shop in the Sanchez/D. Holland/Miley range. Beyond Gio, the pickings are pretty slim from the lower-tier starters still on the board. Yes, Diaz is good . . . but Cano is still owed $120M. That’s an awfully steep price for a closer! Here’s my question/concern about Diaz: he has 109 saves before his 25th birthday, including 57 last year. That’s a lot of high-leverage mileage on a young arm. There’s a lot of data on the overuse of young starters, but I haven’t seen much on young relievers. I can, however, think of anecdotal evidence of several guys who had a couple of big save-total seasons when they were young but who broke down. It’s something to watch, particularly with an organization that doesn’t have a good track record of caring for young arms. I advocated several months ago that the Nats think about intentionally pairing Hellickson and Ross together for four innings apiece. The Nats and other organizations do that with minor-league starters all the time. It wouldn’t be a “6th starter” arrangement; it would just keep the 5th starter slot from wrecking your bullpen. The main downside would be that it would take a slot from your bullpen, unless you decided to carry only a four-man bench. If the Nats don’t do something like this officially, but they do sign Hellickson, perhaps they would keep Ross with the big club as the long man, and this type of arrangement might evolve anyway. Hellickson deal said to be done, and an MLB deal at that. And here I jumped up and down about them not needing a 5th starter. A 40-man slot is needed. I’d say they either DFA Sevy and hope he’s not claimed, or that they try to trade Gott for a bag of balls. He’s out of options and not likely to make the team. Tea-leaf reading: they’re not 100% confident in Ross’s recovery, and they STILL don’t trust Fedde. Really, if they don’t trust Fedde by this point, they should trade him. I’ll eschew doing another post on Hellickson (too busy right now). Like the signing, agree with everything KW said. I also think Gott is first man off; he’s top of my list of “first man to go” off 40-man. Gott, Solis, Severino, Sanchez are my first 4 off. Past that you’re digging deep. Ross still has an option. Looks like he’s heading to Fresno. At least he’s closer to home (he’s from Oakland). And he won’t be pitching in 30-degree weather. I like this move, a lot. Replacing Ross with Hellickson may actually push my opinion of the Nats rotation above where I’ve got them now…maybe. I’m waiting for Keuchel and Gio to sign before publishing my 2019 rotation ranks post. I wouldn’t DFA Solis as I think he has trade value. I’ve been speculating about his fate all winter as he seems very borderline to make the team. I do share Wally’s oft-stated concern that Solis might go somewhere else and become the next Trenien/Vasquez, as he has that kind of stuff. But he also has reverse splits and can’t really fill a loogy role for the Nats. I wouldn’t be surprised to see him go, but I also wouldn’t DFA him. Hellickson was often dominant for four or five innings, but he HAS to be used that way, and he HAS to agree to be OK with being used that way. As for Ross, I think folks forget how good he was in 2015 (3.62 xFIP) and 2016 (3.87 xFIP). I don’t know that he’s been completely healthy since then. So let’s get him completely healthy. I don’t think Helly was a good use of the remaining money. I like him fine as a #5, but as KW has said a few times, I think a quality RP was a bigger need, so if this eliminates their ability to add that, I’d vote against him. But if the plan is to put Ross in the 7/8th inning, I can get behind that. Not sure he has the pure stuff for it, but he’s good enough that its worth a shot. I’d keep Fedde in AA and stretched out as 6th starter insurance. Wally I think it was a great use of the money. Relief pitchers don’t matter much when you’re already down 5-0 like we were many of Roark-Gio-Fedde-Rodriguez starts. I thought Stras and Hellickson injuries really cratered the season. Many more options to fix relief problems than starting pitcher problems. I think the best option here with Ross is have him stay in Florida until mid-May. He’s very much innings limited in 2019 and if he’s effective the Bats can use him in September+. By mid-May a good chance that someone in the rotation will be hurt anyway. Personally, I wasn’t a fan of how much pressure Hellickson’s 5 inning starts placed on the bullpen last year. The only way I see his re-signing as a plus, given that the same idiot manager who blew out the bullpen last year will still be making the game decisions, is if Ross is indeed retained as a long reliever and able to effectively back fill every Hellickson start. At least Hellickson came relatively cheaply, though bringing him back shows how little confidence they have in the already 26-year-olds Ross and Fedde as even 5th starters, which is unfortunate. Karl I disagree. What’s wrong with 5 great innings? We pay $30 million for 7 great innings. if this team knew how to manage their starters success we’d have won a few more playoff games. Davey Johnson was the only one who did it right. Pulled his pitchers an inning early and really watched the pitch counts. The innings Scherzer logged in a lost season last year were ridiculous considering our future investment in him. Miller, Solis, Gio, also ruined early. Same happened to Felipe Lopez with Dusty. Fedde ruined with that stupid high pitch count game trying to get him his first big league win. Use the last one or two bullpen slots with rotating option guys who can pitch all the junk innings. Our aces losing an extra game or two with bullpen implosion pays for itself later with better starts when their arms aren’t dead. Sometimes you have to lose the battle to win the war. Both of the above good points. Hellickson only going 5 innings would not have been an issue with a competent manager. The Nats never had a designated long man like they did with Stammen all those years. Good conversation. There are a lot of smart takes here, even from both sides of disagreement. Yes, I probably would have preferred a reliever, maybe old friend Ollie Perez who was terrific last season ($2.5M to reup with the Tribe). I don’t think five-inning Helly killed the bullpen last year, at least not by himself. The bigger problem became when the ‘pen was having to clean up messes from Gio and Roark at the same time, and then from Fedde/J-Rod as well after Stras went down. The rest of the rotation as currently constituted should be 6-7 inning guys, and if the bullpen has only one four-inning stint a week, it should be OK. I do have concern about them not really having multi-inning guys in the ‘pen, though. Grace and Miller can do it on occasion, but Grace has been so effective that he’s sorta been promoted from his long-man role. J-Rod did several long-man stints, but then they also had him starting some, resulting in short starts that some other long man had to fill. As noted, I wouldn’t mind seeing Ross, if he’s healthy enough, stay with the big club and fill the long-man role. Could he also be a late-inning guy, as Wally mentioned? I don’t know. His plus slider would theoretically make him someone who could come in and befuddle folks for an inning. He might also benefit from hanging around a slider master in Corbin. This really is going to be a rotation full of guys who know a lot about pitching. They’ve got a likely HOFer at the top of it. Corbin and Sanchez have completely reinvented themselves over the last couple of seasons, with great success. And Hellickson is a master at keeping hitters off balance despite limited velocity. Perhaps Stras will benefit from being around these guys as well, as he’s getting to the age where he won’t be able to blow everyone away. Should be fun! I also want to note agreement with Marty that Martinez needs a quicker hook. It sorta seems contradictory to say that when he also got beaten up so much (with some justification) for overuse/misuse of the bullpen. There were way too many times last season where he left guys in for an inning too long when it was clear that their stuff was starting to wane or that their pitch counts were too high (Max). Everything is interrelated, and part of the reason Davey probably let Max go a little longer was that he was trying to save an inning from his overtaxed bullpen. Yes, it takes balls to take the ball out of the hands of a Hall of Famer, but you’re not going to be an effective manager if you can’t do it. And every shorter start that Max has in May and June will pay dividends in September and (hopefully) beyond. I’ve been saying since the beginning of the offseason that the team that made the most sense to me for Harper was the Giants. They were really the only big-money team with the cap space and the OF need to go after him. They’re on the West Coast, and they’re also in desperate need to upgrade the profile of their club to keep powering those sellouts. A team that is selling out every game can’t afford to blow up that fan base by going into tank mode. For all the talk about how taxed our bullpen was last year … do you guys know that we ranked 27th out of 30 teams in total reliever innings in 2018? Todd, that’s a big WOW! Not surprisingly … the Nats were 5th in total innings pitched by Starters. So the narrative of “our starters left too many innings to the releivers” may not be accurate as a whole. – Gio: 27 starts for Nats in 2018. Just 10 quality starts. 16 times he was pulled without completing 6 innings. the 1 other time he pitched 6 and gave up 5. I don’t think he pitched past the 7th but one time. – Roark: 30 starts. 17 quality starts. So more than half the time he’s putting the team in a position to win (the correlation between quality starts and a team win is really high. Teams win slightly more than 2/3rds of games when they get a QS out of their pitcher. .677 as per this link: https://www.baseballprospectus.com/news/article/13198/prospectus-hit-and-run-a-quality-stat-better-than-wins/. Just 8 times he was pulled w/o reaching the 6th. The remaining starts include 4 starts where he pitched into the 6th but gave up enough runs to nullify the QS, plus a rained out start. so, despite all the kvetching about Roark’s season .. on a whole it wasn’t terribly bad. And his ERA+ confirms it: 98. Just slightly below MLB average. – Hellickson: 19 starts. just 2 quality starts. another 10 starsts where he was “in line” for a QS but got yanked in the 5th having given up 0-2 runs. A few times he got pulled with 5 2/3rds pitched. He gave up more than 3 earned runs just ONCE all year; he basically only had one bad start. … But he was putting 4 innings or more onto the bullpen every start; taking out hte one start he had where he threw 1/3 of an inning, he averaged a hair over 5 innings per start all year. Overuse is more a case by case basis. Miller was un-hittable when he was fresh early in the year. Then he became very average after being used way too much. Same thing with Felipe before we traded him. Gio was good until we let him go too long a few times in a row. Max got worse as Davey stupidly tried to chase a Cy Young for him. Stras pitched too many innings early after having a cyst or tumor removed from his back in the offseason. If one of our aces is up big or down big in a game, pull him an inning early to save his arm. Not just for the post season but even mid-season dead arm period. We’ll lose a couple of those big lead games but it will be worth it in the long run. If we’re down 4 or more runs in a game I would not let one of our top 6 relievers touch the ball. 90% chance we lose those games so don’t kill good arms for the low probability outcomes. Also what drove me crazy about Dusty especially was he would play the b -team alot when Max was pitching, resting Murphy etc… His starts cost $1 million each! You have to do everything you can to win those games. And sitting your best offensive players there taxes Max more in a low scoring game where he has to pitch harder. Rest your stars when #5 is pitching as those are lower win probability games anyway. Agree that Martinez was poor at bullpen management, hopefully he has learned. And totally agree about resting Max more strategically. But Rizzo is also getting outdated about the way pitching staffs are built and used. having several SPs going 6-7 innings while making 30 starts is already a dinosaur. 175 IPs is going to be the new normal of a quality workhorse. Rizzo needs to build his staff that way now. The good news is that he has a bunch of optionable choices to fill low leverage innings, like McGowin, Austin Williams, Fedde, voth, Adams, and some of those new guys whose names escape me. I’d use the heck out of them then send them down (or DL) for a week and half. Rinse and repeat. Lastly, I stand by my earlier comment – I think a Will Smith type in the pen would have more positive impact on 2019’s performance than Helly, (whom I like fine), even at half the IPs. Having another quality guy to turn to late, and bridge during the inevitable injuries, is critical. Gio never threw more than 90 pitches in any of his five starts for the Brewers . . . and the Brewers won all five games. In the three games in which Gio was credited with the W, he gave up no ER. Yes, the Nats’ rank in bullpen usage is surprising. Still, the bullpen burned out. Martinez had guys warm up who he didn’t use, sometimes night after night. Other guys he used three nights in a row. How could he be a bench coach for all those seasons and not understand the dynamics of such things? If the Nats are looking for the potential “next Stammen,” I would keep an eye on Austen Williams. He’s just a year removed from starting and worked quite a number of multi-inning appearance in the minors last year. His cup of coffee in Sept. showed that he may still need some seasoning to be ready for the majors, though. Realmuto to Phils. They’ve improved, but as noted above, they’re still short a couple of viable starting pitchers. The phils are looking pretty good, and maybe not done. They could be tough, as could the Mets (although I’m less concerned with the Mets beyond 2019). Braves, I dunno, seem worse but maybe their kids take a step forward. Here is a shock take for Nats: Soto regresses from 2018. I think he’s still good, just goes through a season of adjustment and falls off about 15% offensively. I’m glad the NL East is better. I don’t think a cakewalk regular season has helped the Nats in the past. Let them fight it out and earn it, then go hunting in the post season. If they don’t make it, then so be it. Phils: starting pitching. They have Nola, a rapidly regressing Arrieta (3.96 ERA) and three other young starters who posted ERAs well over 4.00. It’s somewhat a leap of faith to think that all of them are going to make a significant improvement, although all did have reasonable FIPs. I do think they made a great deal for Realmuto, as I don’t think the Fish got a particularly strong package in return. Robles by himself was probably better than that quartet. With Soto, it’s hard to know whether any of his stats are dramatically out of line with anything he did in the minors because he never had a full minor-league season. No one is regression-proof, but his ability to make adjustments and to take walks should keep him out of prolonged slumps. One thing that could hurt him is the human element, similar to what happened to Harper at times — if the umpires peg him as too cocky and start squeezing the strike zone. I think he’s going to stay solid and have at least 30 homers. Good evening to all. Fantastic discussion as always. Even with the inherent innings limitation for Hellickson, as the #5 starter, I feel much better about the starting 5 than I did a week ago. Scherzer is a constant, even with a possible regression. Strasburg, if fully healthy has the potential for a few more wins. Will his velocity be back? Can he become more of a pitcher instead or in addition to being as dependent on overpowering stuff? A healthy and effective Stras is key if the rotation is to be outstanding. Corbin vs Gio is a distinct edge for thus rotation. Plus he might continue his upward progression as a front-line starter by pitching in Nats Park, rather than in Chase Field. Sánchez vs Roark… if it’s similar to the 2018 versions, Sánchez has a clear edge. Ultimately, it might be closer to a draw. Anything more is gravy. Lastly, we have Hellickson. With proper use, it’s better than the uncertainty surrounding Ross after TJ or Fedde. Dark horses are McGowan and Crowe, as I’m pessimistic about Voth’s or Alvarez odds of being any sort of contributors to this year’s staff. Given his public admission of this as an area of necessary improvement in 2019, I’m hopeful. From early season precautions for all starters, to a much better handling of innings limited pitchers like Sánchez and Hellickson. Though, I agree of the evolution taking place across the Major Leagues, with starters coming out way early (175ip starters). We need to improve that transition from the starters to the relief corps. But my biggest concern with DM was burning out guys by having them warm-up in the bullpen more than once a game, as well as on too many consecutive games (one reason why our burnt-out bullpen did not show more game-time usage). Doolittle, Rosenthal and Barrclough are set. After that comes the tough part. Who does the 7th and 8th when Barraclough and/or Rosenthal can’t go? My favorite, the brittle Glover if healthy. I would put Miller second, and Solis as a dark-horse if he shows 2018 was an aberration. Another distant possibility, that Rainey finds his command and flourishes in Washington (while something similar could be said of the often forgotten Cordero). Then come the innings eaters with the rubber arms. As mentioned earlier, our choices are still mostly unproven over more than one season. Grace seems like a shoo-in, and Nuño given 2018 and with his minor league versatily might be another. Suero might also thrive in such a role as well. Williams could even be a better choice if his 2018 jitters are gone. Then, there’s also the possibility of Ross holding the 7th spot in the bullpen and spot-starter role. Other dark-horses for those last spots… Bourque and Istler. As for Adams and Gott, their time in DC might have already come and gone. One last thing, there could be one or two last minute competitors added during Spring Training. Sipp? Diekman? Etc.? Who says we can’t dream. (1) Díaz potential regression as a lights out reliever – KW, I do agree that such a possibility is high. History is full of examples, and for every durable reliever, there are way more that flame out in a few years. (2) Felipe López – Marty alluded to Felipe Vázquez (aka as Felipe Rivero) by recalling former infielder Felipe López from the difficult years when we were the doormats of the division. (2) Could someone envision Turner in the #3 hole preceded by Robles and Eaton? C, Robles, P ( or P, Robles). Here’s my last comment on bullpen (promise): how do you feel about the pen if I told you Doo is out for July and august? It gets pretty scary to count on Barraclough as your main high leverage guy not closing, right? I think you have to take that into account. I don’t think the Nats will want Robles under the pressure of leading off, at least not this season. Many Nat fans want to see Turner turned loose at the top of the order, envisioning him stealing 70 bases or so. However, Eaton’s OBP was a substantial 50 points higher than Turner’s in 2018, and logic would dictate that the guy who gets on base more often should lead off. I expect to see Eaton leading off, Turner batting 2d, and Soto and Rendon in some order at 3-4. Bullpen: Doolittle, Rosenthal, and Barraclough are locks, and Grace and Miller are very likely unless they’re just awful in the spring. That’s five of the seven slots. There will be a truckload of guys auditioning for the last to roster spots. There are only two lefties among them, Solis and Nuno, but both had bad reverse splits last year so can’t really fulfill a traditional “lefty” function. Nuno is on a minor-league contract but Solis is out of options. As we’ve discussed, when healthy and rested, he has excellent stuff. The other question that will define the bullpen is whether the Nats want a long-man/swing-man like they had with J-Rod. Candidates would be Ross, Fedde, McGowin, Voth, and Henderson Alvarez . . . which is basically your Fresno rotation. Austen Williams would be more the Stammen two-inning type but not a great option as a spot starter. My hunch is that they won’t keep one of the spot-starter types, at least not to start the season. My guess, on the eve of Spring Training, would be that the final two spots will come down to a choice from among Solis, Glover, and Suero. But pity the catchers for the side session with Adams, Rainey, and Cordero. Just noticed that Wally was posting at the same time I was about the lineup. I wouldn’t mind Soto at #2 behind Eaton, as that certainly would maximize OBP. That said, I would be surprised if they pushed Turner down to #6. In 2018, he had 295 PAs leading off, 329 at #2, and 50 at #6 (with random appearances at #s 4, 5, 7, and 8). On a very positive note, if Dozier bounces back, there won’t be an easy out in that lineup. Dozier’s “bad” 2018 still produced 21 homers, and the two new catchers combined for 38. OT – I see ESPN came out with their prospect rankings. Can anyone share some color? I know Law isn’t a fan of the Nats system, but curious if there was anything of interest to share. – normally Law is much more bullish on younger prospects than others … which is why I was sort of surprised on his coolness on Luis Garcia overall. – he’s also kind of down on Kieboom versus others in the industry. I think its b/c he’s skeptical of him staying at SS and is already ranking him as if he’s a 2B. – he’s clearly the high man on Telmito Augustin, having him basically 5th in our system where as nobody else has him higher than 11th-13th. – Lower on Jake Irvin than most. Otherwise his relative ranks are pretty much in line with BAs and a good chunk of Fangraphs. My ideal lineup: Eaton, Turner, Zimmerman, Soto, Rendon, Dozier, Robles, C, P. L,R,R,L,R,R,R,R. We suddenly are very R heavy in this lineup. Not much you can do here; I think Eaton is just your ideal leadoff guy and either Turner or Rendon needs to be in #2 hole. I put Zimmerman 3/Soto 4 b/c of sabremetrics thoughts on having a better hitter at 4 vs 3. If Adams plays instead of Zimmerman maybe you go: Eaton, Turner, Soto, Rendon, Adams, Dozier, Robles, C, P. That’s L,R,L,R,L,R,R,R. Still righty heavy at the end, but this lineup sticks Soto in a bad spot. If Zimmerman is struggling and needs to drop, maybe you go: Eaton, Turner, Soto, Rendon, Dozier, Zimmerman, Robles, C, P. That’s L,R,L,R,R,R,R,R. Ugh. Maybe switch Soto and Dozier so there’s a lefty further down. If it turuns out Robles is the second coming of soto, you switch him and Eaton outright I think. so maybe Robles, turner, Soto, Rendon, Dozier, Eaton, Zimmerman, C, P. that’s R,R,L,R,R,L,R,R; good balance. Trevor Gott DFA’d to make room; good prediction for those who predicted it. So on Law’s ranking, were Robles, Denaburg and Kieboom top 100? And where did the system rank, 20-25? Hope Gott clears waivers. There might be a good chance of that considering how many FAs are still out there at the moment. System ranking is fairly crazy to begin with. I would say that the Nats are in the latter half of the teens. A lot of the quality of the system going forward will be tied to whether many of the arms they drafted in ’17 and ’18 develop into anything. Early returns on the ’17 class aren’t good, other than for Crowe, who hit a wall at AA. Todd, there’s no way I’m batting Zim higher in the lineup than Rendon. That’s 140 wRC+ for Rendon vs. 118 for Zim. Rendon is a much better hitter right now at the relative stages of their careers. I don’t think Rendon and Soto will be hitting any lower than 3/4. Let’s see: Eaton, Turner, Soto, Rendon, Zim/Adams, Robles, Dozier, C, P. If Dozier were to regain his 2016/17 form, I could see him being moved up to 5th. OMG — just reading that Keuchel (via Boras) began the offseason seeking a deal of six to seven years with an AAV of $25-30M. That’s insane. He was never going to get a deal anywhere close to that, in years or in AAV. Yes, there are some cases this offseason where players are genuinely getting screwed, but this was/is an ongoing self-inflicted screw job.